Look at that! Somehow I figured it out! Because I’m not a frequent Raveler, it always takes me forever to get these things right – do I first add the pattern, then upload it to the store? Or first the upload, then the pattern? What do I list for “published in”? And so on… Apologies for the delay! Now you, too, can pretend to be my forgetful little cousin and have a Tretta hat of your own! About the hat The Tretta hat is part of a tradition of close-fitting, beaded hats that I’ve been designing and knitting for my little cousin Sarit. 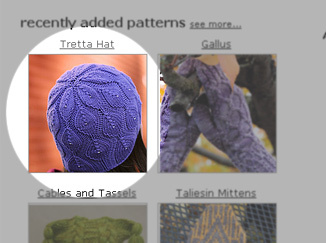 The original Odessa and Black Sea hats having been lost, Tretta is the third in this series. The name is a loose derivative of the word “third” in Russian. 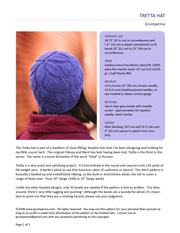 About the pattern Tretta is a very quick and satisfying project, suited for intermediate-level knitters. 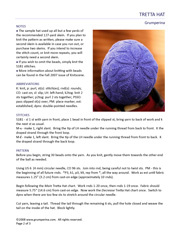 Techniques used: knitting in the round, increases and decreases, beaded knitting, following a chart. 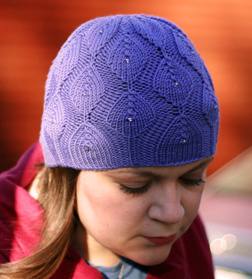 Tretta is knit entirely in the round and requires only 130 yards of DK-weight yarn. A perfect place to use that luxurious skein of cashmere or alpaca! 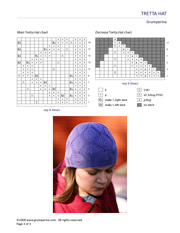 The stitch pattern is basically a beefed-up and embellished ribbing, so the built-in stretchiness allows the hat to cover a range of head sizes – from 20″ (large child) to 23″ (large adult). Unlike my other beaded designs, only 30 beads are needed if the pattern is knit as written. This time around, there’s very little tugging and pushing! Although the beads are a wonderful detail, it’s important to point out that they are a choking hazard; please use your judgment. Sublime Extra Fine Merino Wool DK [100% extra fine merino wool; 127 yd (116 m)/50 g]: 1 ball Myrtle #66. US 6 (4 mm) 16″ (40 cm) circular needle; US 6 (4 mm) double-pointed needles, or size needed to obtain correct gauge. Size 6 clear glass beads with metallic center: approximately 30; tapestry needle, stitch marker. After blocking, 20.5 sts and 33.5 rnds over 4″ (10 cm) square in pattern knit circularly. Three-page pdf file, 3.9 MB in size. Includes knitting instructions in 12-point font, and three full-color photographs. This file can be opened using Adobe Reader. I always provide support for my patterns, but since you’re paying for this one, I will not settle for anything less than your full happiness and satisfaction. I will let you know if there are any mistakes or updates, and you can always e-mail me for help. Do you speak Russian? I have noticed a couple Russian inspired pattern names… Sharfik and Tretta. I’ve been studying the language on my own for awhile now, and it is so beautiful and fascinating! I love the pattern, too! Excellent! DD already gave it the thumbs up :-). it’s beautiful! Just what I wanted in a winter hat for me. Have already bought the pattern, have the perfect yarn marinating, and can’t wait to cast on. Thank you! My goodness, your cousin looks just like you! Nice hat, by the way. Wow! That is beautiful. I’ll have to make one for me and for my little guy (in a manly color of course). I’ve already purchased the patter as well and have the perfect little skein of alpaca ready to go. Too bad I have no beads, although it’s nice to have an excuse to shop! Tried to buy the hat and it got stuck somewhere between Ravelry and Paypal. I am trusting that they will get it figured out and I will be starting this one tomorrow. Beautiful. Everything about it! I especially like the tippy-top. Great design and lovely color! Another terrific Grumperina pattern to make. I finished about 4 beadless Odessa hats this fall, for gifts and for my charity group. I promise to try beading on Tretta – I did buy some beads, lol! As a person with a 24-inch head, I feel compelled to say, excuse me! 23 inches is not a large adult head in the slightest! It’s assumptions like that that make “one-size” hats so darn impractical for us watermelon-heads of the population. Worth the wait! I think we have the new “it” hat of the season. Btw, I’ve got one of those 24″ craniums myself, so I’ll be swatching carefully so my Tretta will fitta! Cute! That’s a great hat series you’ve got going on. I think I’m going to try this hat with some soon-to-be handspun. I’m going to have to wait for Ravelry and Paypal to work out their glitch on my order, though. Update: PDF delivery resolved almost immediately. Just an FYI for those who may get a Ravelry error message upon purchase. That is so incredibly pretty! Gorgeous! Now I just need to figure out if I have an appropriate yarn in my stash. 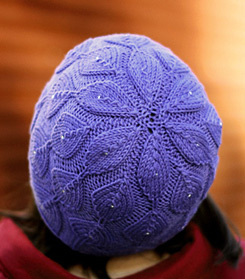 It’s getting cold out and a quick, beautiful hat is definitely on the must have list! That is a gorgeous hat! Thank you for such a lovely pattern. <3 I made one for myself over the weekend and am already planning another. Love it! Bought the pattern right away and knit it in Fibra Natura Mermaid. It’s beautiful! Really beautiful. I love the simple understated beadwork. Thank you for sharing your beautiful patterns. I just made Odessa for my mother-in-law for Christmas. If she doesn’t like it, I’ll keep it for myself! “Crappers. Okay – we’re not perfect. This one’s definitely going on my list. Also, what’s up with the spam in peoples’ comments?